The setting is modern Mexican, while the kitchen juggles tradition and innovation with mixed results. : Ácenar’s modern Tex-Mex label applies equally to the setting and the food, with the former frequently more consistent. But there are flashes of distinction, including lunch options such as the Gulf crab tinga tacos. Check out the duck tinga chalupas with chorizo as well. Lettuce cups filled with a chipotle- and tamarind-accented picadillo are a recommended starter at dinner, and this is one of the few places where you’ll find crepas de huitlacoche, or crêpes with corn fungus, a prized delicacy in Mexico. The adventurous will want to consider achiote-rubbed pork baked in banana leaves. 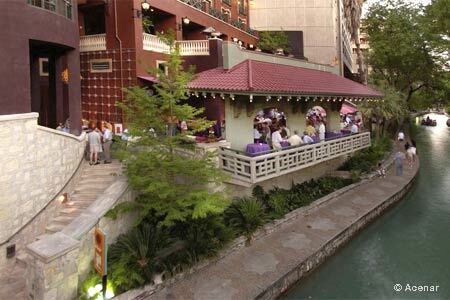 Regarding San Antonio “Favoritas,” we feel that you’re paying an upcharge for the snazzy décor and River Walk setting. But many of the Ácenar Specialties, corn-serrano crêpes filled with duck confit, for example, simply can’t be found elsewhere. Come dessert, we are often seduced by another crêpe, this one filled with cajeta and topped with Mexican vanilla ice cream.